The Breitling Unitime World Timer 1-260 is a perfect companion for a stylish traveler. 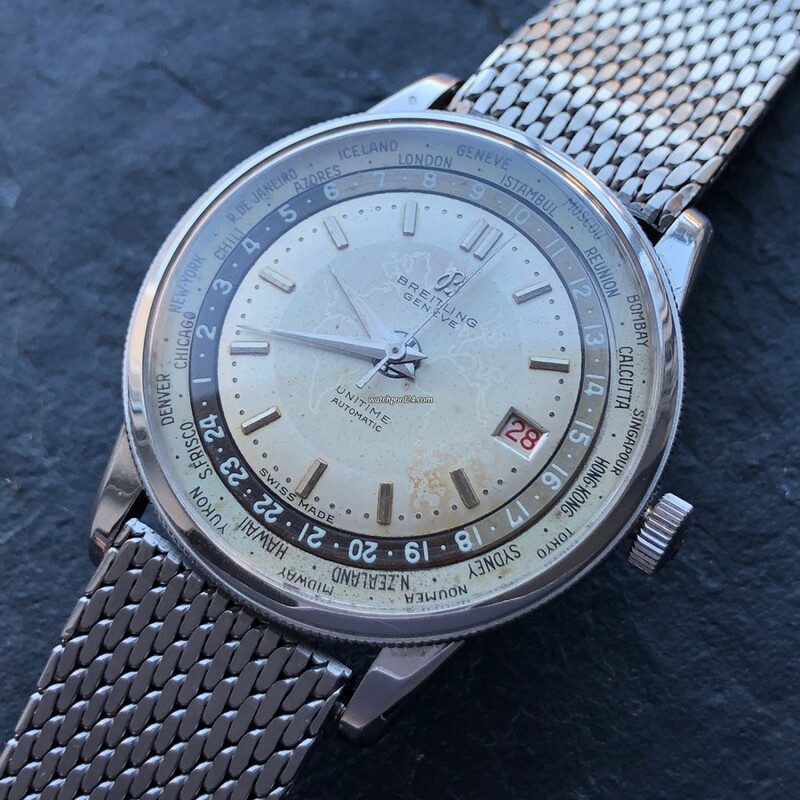 This extremely rare vintage watch dates back to 1955 and offers an impressive vintage charm. It features a 24-hour display, a rotating bezel with 24 cities and a world map in the center of the dial. In the 1950s the interest in international flights increased rapidly. In response to this, big watch manufacturers developed watches which displayed the time in multiple time zones simultaneously. Rolex introduced the GMT Master, Patek Philippe the reference 1415 and Breitling the Unitime World Timer. Here we offer you the first-generation Breitling Unitime with the reference number 1-260. The inner 24-hour ring rotates synchronously with the hands. The rotating bezel shows 24 cities around the world each representing a time zone. By aligning your current location and the time on the inner 24-hour ring, you can read the time in other 23 time zones on the same 24-hour inner ring. In addition, the Breitling Unitime has a date aperture at 3 o'clock with red numbers. The 37 mm stainless steel case looks relatively large due to the fine bezel. The lugs have maintained their sharp edges. The case is in excellent condition without notable scratches. The engravings on the case back are still crisp. The original crown is signed "B" for Breitling. The watch comes with a beautiful vintage stainless steel bracelet. An interesting feature of this Breitling Unitime is a hallmark on the upper left lug. Many reports and our own experiences prove that the watches imported to Portugal bear this kind of hallmarks. Probably the hallmark was added to indicate that the tax has been paid. The Breitling Unitime is powered by the automatic caliber Felsa 711. The watch is fully functional. Most Breitling 1-260s came with a gold case. In contrast the steel version of the Breitling Unitime is one of Breitling's rarest and most sought-after vintage watches.